Home to fine wines, impressive châteaux, rolling countryside and a mighty river, the Loire Valley is undisputed as one of France’s most-beautiful regions. 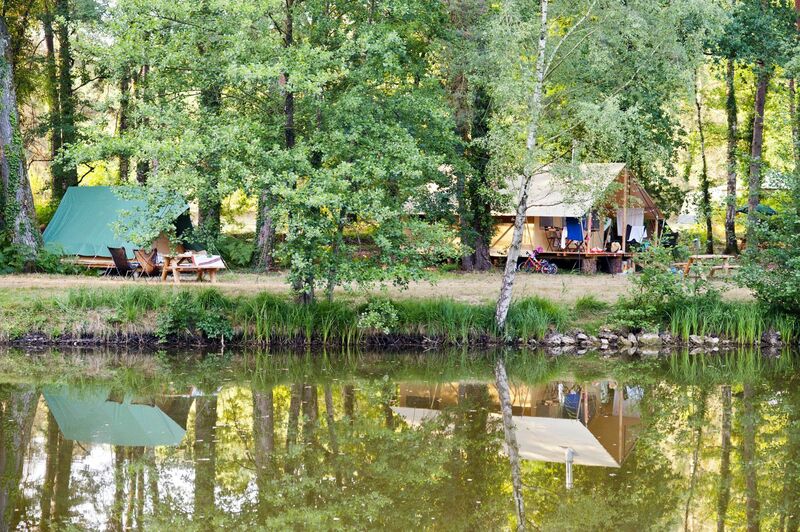 It’s perfect camping country with campsites tucked amid its greenery, on the banks of the river and even in the grounds of some of its magnificent châteaux. There’s plenty to do on days out too with walking, cycling, kayaking and canoeing being the best way to see the sights. Stretching for 170 glorious miles, from Nantes near the Atlantic Coast to Orleans in the heart of the country, this river valley is one of the most popular places to pitch in France and it’s easy to see why. Some of the most scenic countryside in all of the Loire Valley is found in the Eure-et-Loire region, home to watery tributaries, châteaux aplenty and still within easy reach of Paris. Whether you're taking the tent or trucking along in a campervan, this is an incredible place for a camping holiday. 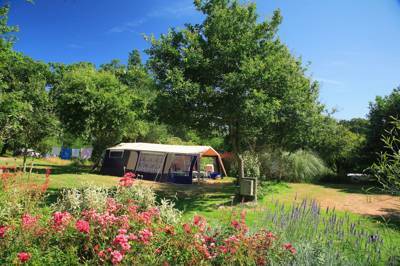 If you're going to go camping in the Loire Valley then where better to camp than on the banks of the River Loire itself? The Indre-et-Loire department of France is home to several spectacular campsites right along the river's edge, so grab the tent and hit the road. You know where to go. Combine the beauty of the Loire Valley with the pristine beaches of France's sandy Atlantic coast and you have the recipe for a perfect camping holiday. Discover the best places to pitch your tent or park the campervan with this hand-picked collection of truly exceptional campsites in the Loire-Atlantique department. From the scenic estates of might French châteaux, to tiny family farms with pitches by the riverside, discover the best campsites in the Loir-et-Cher department and take up the perfect camping position in the Loire Valley with this special collection of camping and glamping sites chosen by the experts at Cool Camping. Home to the most historic towns and villages of the entire River Loire and home to swathes of countryside recognised as a UNESCO World Heritage Site, the Maine-et-Loire department in the Loire Valley is a true camping haven and an excellent place to pitch your tent or park up the campervan. Discover the very best campsites in Maine-et-Loire with this specially chosen collection, all hand-picked by the Cool Camping travel experts. Kick back in the campervan, pull up a caravan or pitch your tent in one of the best campsites in the Sarthe department of the Loire Valley with this collection of truly exceptional campsites, all hand-picked by the travel experts at Cool Camping and reviewed by fellow campers and outdoors enthusiasts. 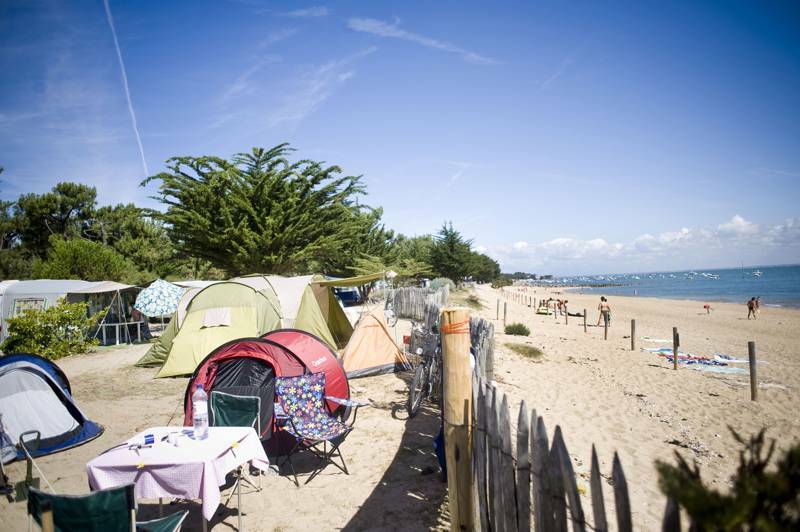 For all your camping needs in western France, look no further than our list of the best campsites in the beautiful region of Vendée. Pitch a tent close to the beach, park your motorhome up in a garden campsite, or find a glamping spot next to a sand dune. You name it, we’ve got something to suit your camping criteria. Choosing the Loire Valley as a destination for your next holiday is easy but finding the best campsite for you and your family can be anything but. As one of France’s most-visited regions, the Loire is peppered with campsites but how do you sort the wheat from the chaff? That’s where the Cool Camping collection comes in. 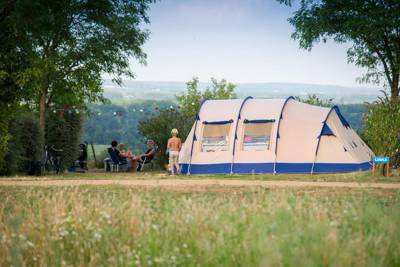 Our team of experts have sought out the best campsites in the Loire Valley and brought them together in one place to make choosing and booking your perfect pitch a cinch. There are Loire Valley campsites on the banks of the river, campsites in woodlands and campsites in the grounds of the region’s magnificent châteaux. We’ve cast a discerning eye over the region to find the ones that deserve a thumbs-up from us for providing an experience that stands out. Some are classic camping sites that have a great location and some are larger sites with first-class facilities and fabulous glamping options. Wherever you choose to stay, one thing is for sure: with the Loire Valley as the backdrop for your camping or glamping, it’ll be a camping holiday to remember with lots to see and do. This beautiful region on the banks of France’s longest river has more than 300 châteaux – many of which look like they’ve been drawn by Disney. It has charming villages and towns, thick forests and peaceful waterways and mile-upon-mile of vineyards. It’s such a special landscape that 170 miles of it, from Sully-sur-Loire to Chalonnes, has been recognised as a World Heritage Site. 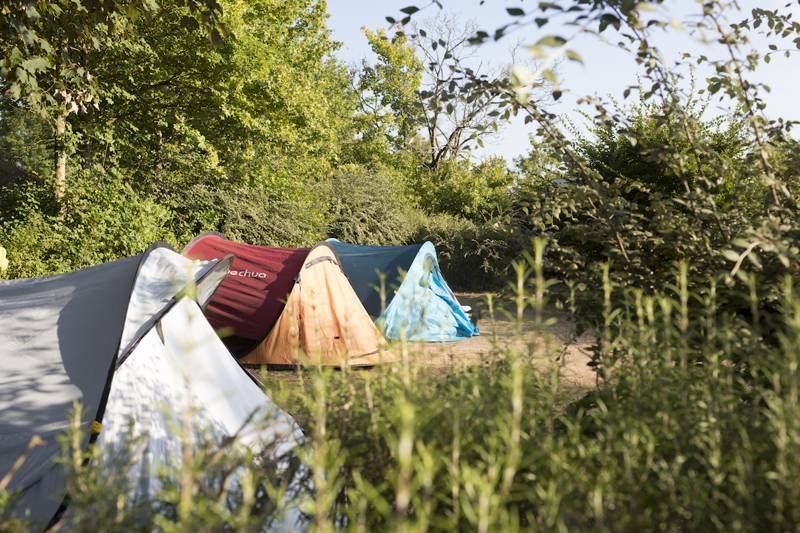 If you love camping, pitching your tent in France is always a pleasure. Perhaps it’s the promise of better weather, perhaps it’s the fresh croissants and baguettes that are delivered daily or perhaps it’s just the excitement of being in a foreign land; whatever the secret ingredient is, there’s no denying that there’s something special about French campsites. Add in a location as magical as the Loire Valley and c’est parfait – as the French might say. The options for tent camping in the Loire Valley includes riverside campsites, as you might expect, but there are many more options too. We’ve found Loire Valley campsites in woodlands and in meadows, on the edges of some of its historic towns, near the beach and in deepest countryside. So whatever type of campsite you prefer, you’re likely to find your match among our collection. Classic camping can offer a touch of adventure to your holiday whether you are a family with a six-man tent and a brood of little campers jostling for space in the car or a hiker with a one manner strapped to your backpack. It’s great value and just about the most eco-friendly way to holiday too. Here at Cool Camping we tend to favour smaller, independently-run campsites but we make an exception if we find a site that has managed to maintain a sense of the camping ethos we subscribe to: helping people enjoy the great outdoors by fitting in with it rather than concreting over it. 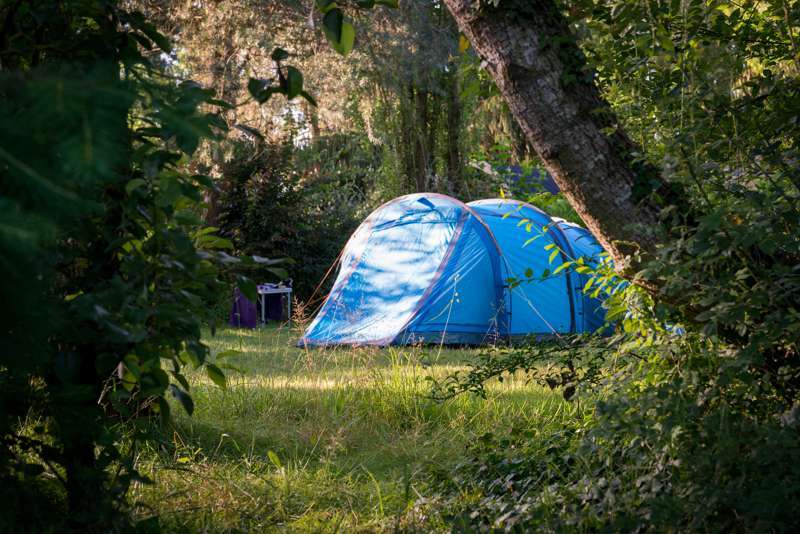 Our collection of Loire Valley tent pitch sites includes both small sites where you’ll be one of a lucky few and larger sites where you’ll have access to fantastic facilities. If the facilities hold more appeal than flysheets, groundsheets and guy ropes, and you consider yourself more glamper than camper, the Loire Valley is still a great destination. The French have been offering pre-pitched tents on campsites for decades so glampers are well catered for and the range of what’s available is impressive. 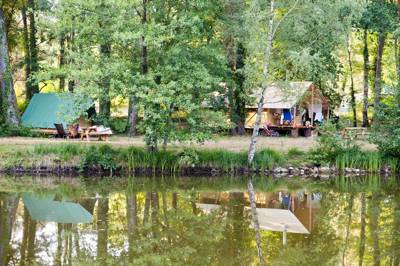 Safari tents are the mainstay of many French campsites and the Loire Valley is no exception. There are basic safari-style tents which offer a little kitchenette, separated canvas bedrooms and camp beds and there are more luxurious options too: more safari lodge than safari tent with wooden floors, shaded verandas, proper furniture and more. There are also cabins and camping bungalows and roulottes (France’s answer to gypsy caravans or shepherd’s huts). With glamping holidays on the up-and-up there are always new options being added too from bell tents and yurts to tipis and treehouses. How luxurious you want to go will be down to personal taste. You may want to keep it simple and stay under canvas in a basic tent that’s pre-pitched for your arrival or you might love luxury and the outdoors in equal measure and want a place with your own bathroom attached – or even a hot tub for your own private use. 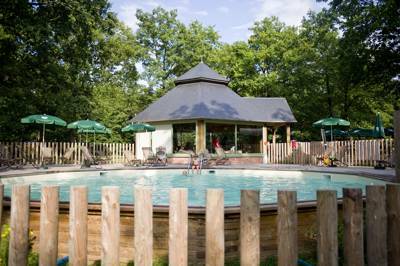 Among our Loire Valley campsites are a number of sites owned by Huttopia. We usually steer clear of branded, big-name sites as they can be impersonal and not to the taste of the Cool Camping clan but Huttopia has managed to break the mould. While their sites cater for large numbers of campers and glampers who head for the Loire Valley they also manage to retain the ethos of a classic campsite. 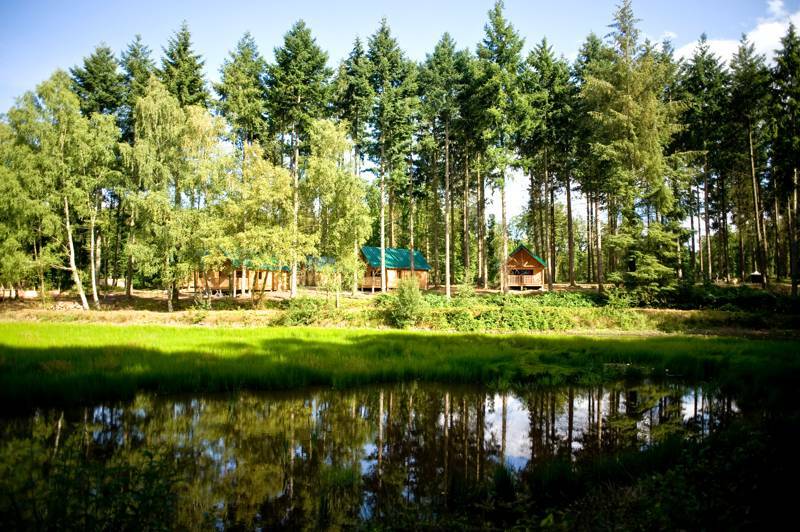 Huttopia sites make a conscious effort to blend accommodation and facilities in to the natural surroundings using natural materials and colours in the glamping accommodation they offer which usually includes safari-style tents, roulottes and wooden cabins. They offer facilities and activities for campers and glampers, as you’d expect from larger sites, but with a little twist. Many of them are designed to immerse you in the surroundings and make the most of them: think natural swimming pools, yoga, archery and basket making. Each site is different, with the location dictating what’s on offer. The people in charge of deciding what makes a World Heritage Site at UNESCO deemed a 170-mile stretch of the Loire Valley worthy for 2,000 years of human interaction with the environment. More specifically, the listing recognises the importance of the architectural heritage of its historic towns, its châteaux and Renaissance-era cultural monuments. It’s the river, France’s longest, that’s shaped the area of course. Rising in the Massif Central in the very heart of France, it’s full length from source to the estuary at Saint Nazaire, is 634 miles – but it’s the middle section, from Sully-sur-Loire to Chalonnes, that it the Loire Valley proper. The Romans brought vineyards and left a legacy still evident in towns including Orleans, Tours and Angers, the Hundred Years War and Joan of Arc left their marks and the Renaissance shaped the châteaux for which it’s now famous. It was a case of the showier, the better until the French revolution. At one time the Loire was a trade route with vessels travelling in from the Atlantic and then through canals connecting the Loire and the Seine, but the route is too narrow for modern vessels and so the Loire countryside has remained largely rural – good news for today’s campers and glampers! It was recognised as a World Heritage Site in 2000. There are more than 300 châteaux in the Loire Valley so we don’t recommend trying to see them all on your camping or glamping holiday in the region. On the other hand, there are some that you may not want to miss. With a staggering 426 rooms and 83 staircases, Chateau de Chambord is considered the king of the castles; it’s the biggest châteaux of the Loire and is surrounded by formal gardens and Europe’s largest enclosed parkland. Building work was started by King Francis I in 1519 and finished by Louis XIV 19 years later. It includes what is considered an engineering masterpiece that is thought to have been designed by Leonardo da Vinci. Before the whole of the Loire Valley was made a World Heritage Site, this place was already at home there. Château de Chenonceau, with its curved turrets and flower gardens, is considered another Renaissance masterpiece and played a fascinating part in the Second World War as it straddled the border between free and occupied France. The fortified Royal Château de Amboise, the elegant Chateau de Azay le Rideau with its “water mirror” moat and the Château Sully-sur-Loire are all worth a look too. But if you like a bit more entertainment with your history, perhaps try the Château de Blois which has a sound and light show projected on its walls on summer evenings and if you’re taking the kids with you, how about Château d’Ussé? It’s got genuine fairy-tale charm as the place that inspired the story of Sleeping Beauty and then there’s Château de Cheverny which has a permanent Tintin exhibition among its charms. You may never tire of visiting the Loire Valley’s châteaux but with literally hundreds out there it’s just possible that you may start experiencing a bit of cultural overload - especially if you go on a châteaux binge. If that happens it could be the perfect moment to hit the vineyards. The Loire Valley’s famous wine-producing region stretches right across the World Heritage Site and beyond from Sancerre in the south all the way to Nantes, near the Atlantic coast. It’s France’s third largest wine region and there’s an 800km wine route if you fancy following it. The wines produced here tend to be fresh and fruity – mostly white wines. In the upper Loire you’ll find sauvignon blancs like Sancerre and Pouilly de Fumé, in the middle section its Chenin blanc and Cabernet franc – in the lower Loire, near the mouth of the river, is Muscadet country. There are hundreds of vineyards and wineries where you can slurp your way through a tasting to find wines to enjoy around the campfire or to take home as gifts or to carry that holiday feeling on once you’ve left the Loire behind. There are plenty of towns and villages in the Loire Valley that are worth seeking out but one of the great joys of visiting this region is coming across lesser-discovered gems. There’s nothing quite like cycling, walking or driving around rural France and stopping off in a village that it feels like no other holiday-maker has ever been to before. It’s unlikely that you’ll actually find one of those in the Loire, but with plenty of traditional villages around, you might feel like that’s the case as you enjoy a café-au-lait in the village square. If you don’t like to leave such things to chance you might like to head for some of the villages that have been appraised as The Most Beautiful Villages of France: Montresor with its renaissance château and pretty church, Montsoreau among the Saumur vineyards or medieval St Benoît-de-Sault for starters. The more urban areas of the Loire Valley can also make for great days out from your camping or glamping site. Orleans is the official capital of the region with a Joan of Arc connection, Tours is the most popular city and home to an ancient cathedral while Angers is notable for its medieval buildings. Chartres is famous for its Notre Dame cathedral while Amboise is proud of its château and Leonardo da Vinci connections – its Clos de Luce is where he lived for his final three years. The riverside setting of Chinon and the forested surrounds of Senonches lend a special appeal to those towns. Eat croissants for breakfast at your campsite. Go for a bike ride – with 500 miles (800km) of cycle paths in the Loire Valley, it’d be rude not to. Visit Château de Chambord – this 426-room mansion has to be seen to be believed! Learn about wine-making on a visit to a winery. Walk through Loire Valley vineyards. Explore some of the most beautiful villages in France. Hire a kayak or canoe for a paddle in France’s longest river. Tuck in to a Tarte Tatin in the region where it was invented. Find inspiration to write your own fairy tale in the turrets. Play a game of table tennis or petanque at your campsite. Loire at Campsites in the Loire Valley, Get outdoors and discover the best campsites in the Loire region with this collection of campsites chosen by the authors of the best-selling Cool Camping France book, including riverside campsite, rural campsites, dog-friendly campsites, tent-only campsites and campsites where your campervan is welcome too!